History - Dubuque Stamping & Manufacturing, Inc.
Dubuque Stamping & Manufacturing, Inc. was established in 1948 as a division of Toledo (Ohio) Stamping and Manufacturing. The Dubuque facility, which has been at the same location (32nd and Jackson Streets) since its formation, was originally created to manufacture rocker arms for various original equipment manufacturers in the agricultural and construction industries. The original building was 30,000 square feet and was previously the Piekenbrock Shoe Company. The company started with seven employees. In 1958, the farm equipment section began probing possibilities in the farm equipment industry. Manufactured under the trade name, Farm-Eze, the company’s first product was a barn cleaner marketed in 1959. The following year the first 130 bushel single beater manure spreader was unveiled. In 1961, a 160 bushel single beater version was marketed. 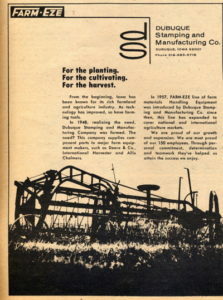 Dubuque Stamping displayed the cross conveyor bunk feeder attachment and power unloader, the unitized bower box, and the 270 bushel truck -mounted manure spreader in 1962. The company was especially pleased with its cattle feeder, the first successful endless-belt feeder ever made. Tested on the experimental farms of several state universities including Iowa State and the University of Mississippi, the feeder was capable of handling 750 head of cattle simultaneously. Among the other products designed in the Dubuque plant was the “Bump-omatic Gate,” New in design and concept, the gate could be opened from either side went a center lever was hit by the bumper of a car or by the front of a tractor. Once the vehicle was driven through, the gate closed automatically. The Stamping division continued to grow and has earned a strong reputation for providing quality products in a timely manner. It has been continually certified since 1999; first as QS-9000 and currently ISO9001:2015. The company is proud to serve several major OEM’s; some for over 60 years. The firm is currently owned by the David W. Spahn family, which has been associated with the company for over 25 years. The company is still in its’ original location, but now occupies 160,000 square feet and has 110 full time employees. Whenever the industry has changed, we have always been able to change with it. Adding new technologies and services for our clients and customers makes us flexible and intuitive to those ever changing needs.